We all have washing machines, and we are using them to wash our clothes, leave them with a pleasant scent and disinfect them as well. But a lot of people have washing machines that are doing the opposite things from these, like leaving your clothes with a moldy cent, and not even close to disinfected, because there is a lot of bacteria-laden mold stacked up inside them. 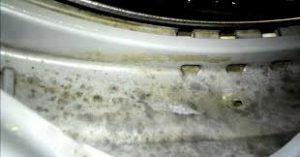 Your washing machine is the best area for the mold to breed. It creates a humid, warm environment which is what the mold is looking for. The washing machines which are loaded from the front, have an air-tight rubber seal that doesn’t get moisture to leave the machine at all. Besides that the mold creates a very unpleasant smell, and it is unpleasant to look at, the indoor type of mold is very likely to cause many health issues. A lot of people are very sensitive when they are exposed to mold, there are a lot of allergic symptoms that can occur, like itchy eyes, skin irritation, wheezing and congestion. There can be even more harmful reactions if people are more allergic to it, or if they are exposed to a larger amount of it. These reactions might cause, shortness of breath, fevers or sometimes a mold infection in our lungs. 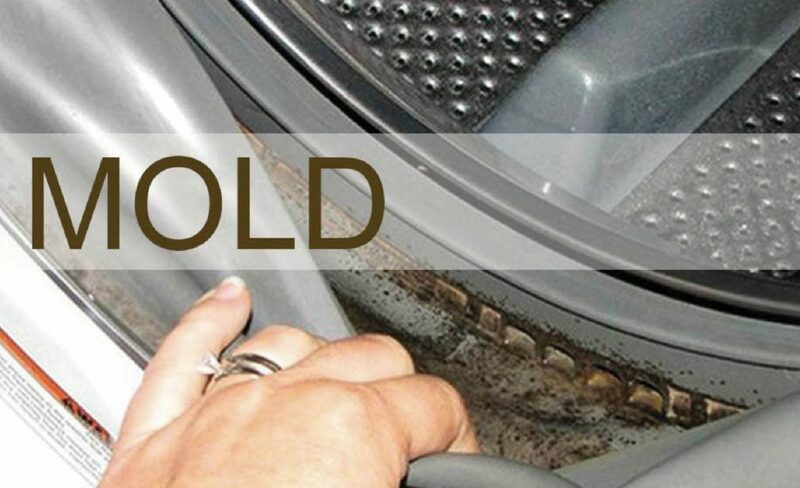 The mold that is stacked up in your washing machine can be quite hard and unpleasant to eliminate. Because even if you get rid of the mold that is visible for our human eyes, on microscopical levels, there is still left some inside, which will make you clean your washing machine again after a few months. Therefore, you will need very effective and powerful disinfectants and antifungals when you clean your washing machine. There are many commercial mold cleaners, but they contain a lot of chemicals which are even more harmful for us, that may cause a lot of respiratory damage and damage to our organs, even more than the mold. Which is why, in this article we will give you a small recipe for a homemade mold cleaner, that only contains 2 natural ingredients and nothing more. Lemon Juice — It was proven many times as one of the best antibacterial and antifungal substances. 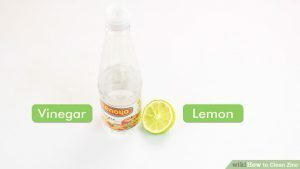 It was also shown that the lemon juice is a good disinfectant and very effective, moist and water conditions, which means it perfect to clean your washing machine from the mold and disinfect it. Not only that, it will also leave the most pleasant lemon smell. Vinegar — According to many researches, the vinegar has been proven to be more effective than most of the famous antifungals. It is cheap, therefore anyone can afford it, also there are no side-effects that may be caused, which make it equally powerful and effective as the medical and commercial antifungals, also it is very safe to use. To prepare this mixture at home is very easy, just follow the few steps below and you will have no problems. First you need to mix 1/4 cup of freshly squeezed lemon juice with a cup of distilled, white vinegar. Then pour the mixture in a spray bottle. Shake it well and sprat the areas where you see the mold appearing, once you have sprayed the areas, let the mixture to act for half an hour. Then get a napkin, dab it into the mixture and wipe the whole inside of the washing machine, and the mold, in order to get rid of it. Also it would be wise to check your washing machine every month, if there are any signs of mold again.